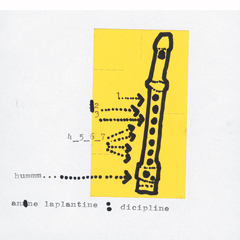 that, her sound is also very un-electronic, because Laplantine uses all kinds of acoustic instruments as sources for her sounds: flute, guitar, bass, glockenspiel and melodica to name but a few. Despite all of its complexity and multi-dimensionality, dicipline sounds light and dreamy, ephemeral yet inescapable and compelling. Hearing this album is the aural equivalent of letting run sand through your fingers. None of these beautiful moments can be held onto, the music is always on the move. Laplantine refrains from repetitions in the sense of 'theme-variation-theme', but makes her music follow the dictate of transitoriness. The artist gives the individual instruments and their sounds much space and thus develops a dense and colourful tapestry of melody and rhythm. By doing so, she in a playful way refers to a series of 7" on emphase records, the tracks on which have been played (or rather 'generated') on one instrument solely (emphasolo). With limitation as the motor of her music, Laplantine develops a music of incredible harmonic density and with a totally individual sound-aesthetic. Despite its being all but a 'fat' production, dicipline is an incredibly powerful production – you simply can't not listen to it! Over the years, Anne Laplantine has deliberately confused her audience by recording for different labels under many different guises: As MICHIKO KUSAKI she had a release on the Vienna-based "Angelika Köhlermann"-label, for "Tomlab" she recorded as ANGELIKA KÖHLERMANN and ANNE HAMBURG. The list of releases and tracks she put out under her given name is already awe-inspiring.